The history books refer to it as the Tri-State Tornado of 1925. Meteorologists have named it the Murphysboro (Mo.) Tornado, after it’s general point of origin. However, in Posey County, Indiana, the devastation wrought on March 18, 1925 defies the distanced terms of scientists and newspaper writers. In the far southwest reaches of the Hoosier State, along the Wabash River, what occurred on that day is called the Griffin Tornado. During my research for my post commemorating the 88th anniversary of the Griffin Tornado, I had the pleasure of speaking with Posey County (IN) Historian Glenn Curtis. During our phone conversation, it was revealed that Glenn and I share mutual friends in Saundra Jackson and Janice McGuire, curator and board president respectively for the Levi Coffin State Historic Site located in present day Fountain City, Indiana. Glenn is a direct descendant of Levi’s wife, Catherine, nee White. Glenn had done some family history research that brought him in contact with Saundra and Janice, with whom I’ve worked as a volunteer at the site. At the time of our phone call, Glenn was wintering in Florida and was in the process of heading back to Posey County. He promised to call me if he came across any further material on the tornado. True to his word, which I never doubted, Glenn phoned me a day or so after having attended the Posey County Historical Society’s monthly meeting, one whose main topic was the Griffin Tornado’s 88th anniversary. Glenn informed me that a letter was read and copies distributed that gave a gripping, personal account of that terrible day. He then took the time to read to me his copy of the letter. After sharing the contents, Glenn promised to send to me a copy of the letter “by Pony Express.” The letter arrived within the week. My interest piqued by the keenly descriptive writing of the letter, I set out to contact the rightful owner of the letter. I discovered the Facebook page of the Posey County Historical Society and subsequently sent off a message asking for help in securing permission to reprint the letter. The group’s president, Becky Higgins, directed me to the post by Nancy McIntire Whelan, daughter of the following letter’s author, Mary Aline Runyon. A subsequent communication on Facebook between Mrs. Whelan and me resulted in a gracious and enthusiastic endorsement of publishing her mother’s letter. 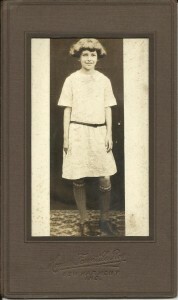 The author, aged 11 at the time of the photo in 1925. 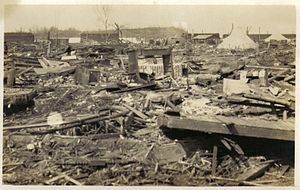 On March 18, 1925 a terrible tornado came thru our country from the southwest, killing 54 in the general area, livestock was killed, many buildings demolished and the town of Griffin very nearly flattened. He said he butted against laths and clawed at bricks until he was free but they perished. Two more classmates died, too. Lester Price in the fire and it is supposed Virgil Horton did but no sign of him was found. Lucille Stallings was in George Doll’s store, huddled by the huge iron money safe, save from death but severely injured. George Doll was, also, and for months it wasn’t known if he would see. Mr. Stinson was picking his way home in the north part of town when Blanch Doll ran to him (their house is where M.E. building is). She said, “Oh, Mr. Stinson go tell George our house is blown away”. She was in such shock she hadn’t yet seen that all else was gone, too. He explained to her and it was as though she awakened from a dream. Then she got to the store ruins as fast as she could, digging the bricks away from George until her fingers bled. Some of Mae Young’s family fell thru their basement. One of the girls had the piano on top of her. George Westheiderman, the big strong blacksmith, their neighbor, tried but could not move it. But Mr. Young, slightly built, lifted it off her. But she was dead, Clarrisa, older than me, and Vera, a year younger than me, died too. Our friend, Mary Ashworth, was on the same bus as Ted McIntire (he was almost 10 years old). The driver stopped in front of the VanWay residence to let Harry, Helen and Evelyn off, then he decided to wait there until the clouds let up. Harry ran back to the bus to talk to friends and stood on the back step, as you entered the bus from the back. He was killed there. The bus body was torn off, just the driver’s seat and steering wheel remained. Chick Oller, the driver, died. Ethel Carl, Ruby Cleveland, Helen Harris and Helen VanWay died the next day. Ted got a cut low on his head, Albert, his brother, had a broken leg. Vernon had gone to visit school that day as he wasn’t old enough to be in school. What a day to have gone! I believe a little Wade boy was killed, too. No history is practiced in a vacuum. The bug many if not most amateur historians share is one of community, one of willing giving to other an insight to the past. I had no idea how rewarding my choice of the Tri-State Tornado as a blog topic would be, but my experience is, I hope a beginning of a long connection between persons I’ve not yet met. Yet. I close with a special thanks to Glenn Curtis, who has not yet taken to the Internet fad for various reasons. That is our loss. I also wish to thank the Posey County Historical Socieity whose Facebook Page is now a regular stop on my browser. Finally, I’d like to thank Nancy McIntire Whelan, not only for allowing me to share her mother’s beautifully written account of the tornado and its aftermath, but for being a faithful guardian of an invaluable document. To my recollection, I’ve never been to Posey County. Such a visit is now a high priority of mine and I hope to meet Glenn, Nancy and others, perhaps at the Griffin’s Depot Diner where we can share our love of history over a meal and coffee. When we do, I’ll be sure to reference what happened in that tiny rural ton nearly nine decades earlier as the Griffin Tornado.